The ever-interesting Queensland Art Gallery currently has an exhibition of English quilts on loan from the Victoria and Albert Museum. 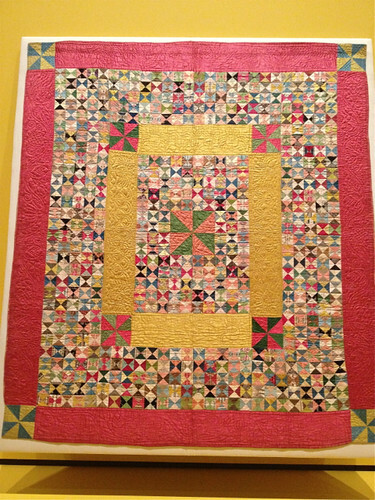 The quilts date from around 1700 to 1945 and include examples of patchwork, applique, embroidery, inlay applique and quilting. 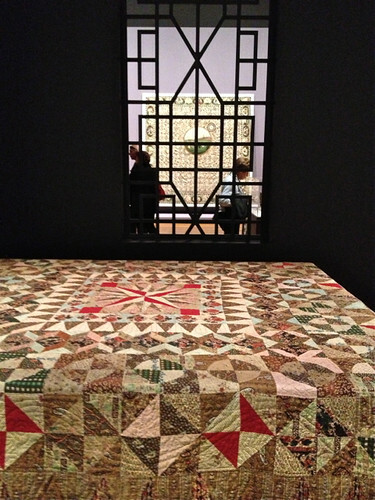 The exhibition focuses on the social context of the quilts and quilt-making, rather than on techniques of construction or elegance of design. Nevertheless, many of the quilts are visually pleasing, and you can't help but marvel at the skill and patience of those - mostly women - who made them. The earliest quilts are elaborate - often made from silk or velvet fabrics, or printed cottons brought back from India. They were commissioned by or constructed within wealthy households and were often associated with significant events such as births or marriages, or were gifts to patrons. The example below is reputed to have been made for the marriage of Mary Parker in 1770, though most of the silks used for the patches are ribbons dating from 1720 to 1740. Fabrics were precious and hoarded. 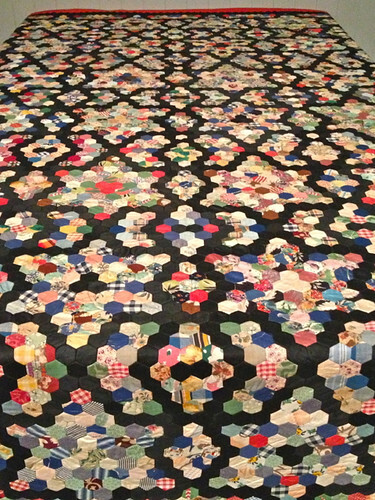 Quilts were often re-patched, or parts of a quilt were recycled into another. The patchwork quilts from this time use the 'English' method of construction with each patch shaped around a paper template. 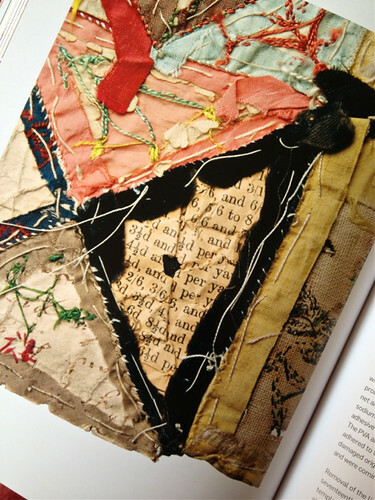 As paper was also precious, the templates were constructed from recycled newspapers, pamphlets, records of household accounts and letters and consequently are useful in dating the quilts and setting them in their social context. With the industrial revolution in the nineteenth century fabrics became cheaper and more readily available and quilt-making was no longer the province only of the wealthy. I was particularly taken by the curator's comments about the Victorian belief in the improving quality of patchwork and quilting - for example, the patience, diligence and skill required to make the quilts was seen as an appropriate reforming activity for female convicts. As well as the borrowings from the Victoria and Albert Museum, the exhibition includes the amazing, huge 'Rajah' quilt from the collection of the National Gallery of Australia that was made by women convicts being transported from Britain to Australia on the ship 'Rajah' in 1847. Patchwork, quilting and embroidery were also promoted as desirable activities to divert soldiers from drinking and other undesirable activities during the inevitable downtime of lengthy postings abroad. 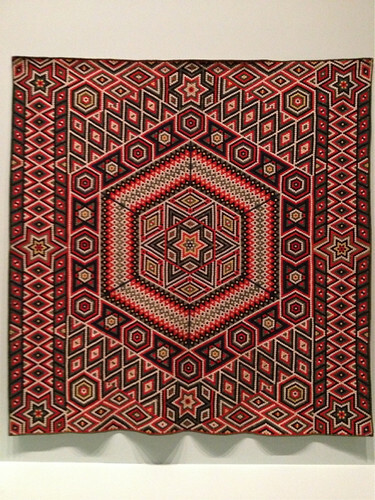 The geometrically complex and sophisticated quilt on the left below is one such quilt; constructed by a soldier or soldiers from tiny one and a half centimetre hexagons of uniform fabrics while in India around 1870. The twentieth century quilts are, on the whole, more everyday and pragmatic, often made from scraps of fabric recycled from clothing or old curtains or furniture fabrics. 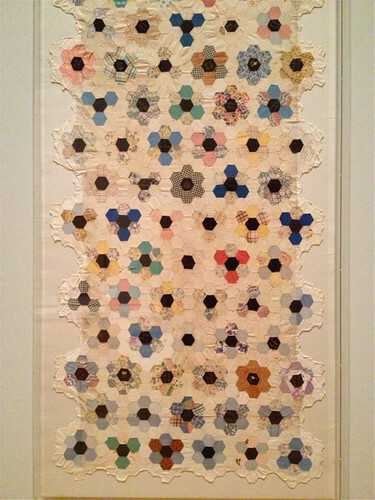 The right hand quilt above, in a complex pattern of hexagons, was made in the immediate post-war period from the black-out curtains used during the war, together with fabric scraps scrounged from used clothing. The most poignant cloth in the exhibition is incomplete. The simple hexagonal design was made by girl guides who were part of a group of British civilians imprisoned in Changi prison in Singapore during the second world war. They were making the quilt for their troupe leader when it was discovered and confiscated by the guards. You can only begin to imagine the sacrifices that must have been made to find both the materials and the time to sew the cover. In a week when our now (sadly) former Prime Minister was being denigrated in some quarters for the supposedly frivolous and pointless pastime of knitting it was ironic to see both the popularity of this exhibition of traditional, mainly feminine crafts, and the serious and well-researched approach taken by the curators. I'm going through a very unsatisfactory knitting time. After I pulled the needles out of my Viajante shawl (poncho, poncho!) and left it languishing while I tried to figure out how to unravel and rewind about a kilometre of yarn, I searched for a suitable project for the beautiful Shilasdair yarn I'd bought at the Breidag while I was in the Netherlands. I have four 50 gram skeins of the yarn, which is a most luxurious mixture of cashmere, baby camel, angora and merino lambswool. The air miles associated with this yarn are a bit horrifying as the yarn is sourced from Peru, then dyed in the Shetland Isles. I bought it in the Netherlands and then it flew back to Australia with me. But then, particularly if you live in Australia where Australian-grown wool is usually sent off to China for processing, then to Italy for dying and distribution, the air miles associated with most yarn are disturbing. My four skeins of yarn are four different colours that shade into one another. I had difficulty finding a pattern that I could adapt to feature the yarns and subtle colour changes and eventually decided on Lisa Mutch's elegant Askew shawl/scarf. A friend had already knitted this pattern and I liked the asymmetrical draping of the point of the scarf as she wore it. So I worked on the shawl/scarf, loving the yarn as I knitted. I decided to work through the spectrum of the colours I had, merging one into another by using stripes interspersed with plain colours. Maybe the name of the pattern was a warning. My old Oxford dictionary tells me that one of the meanings of 'askew' is 'wrong; awry', as in 'the plan went sadly askew'. A perfect description of what happened. The scarf/shawl that results from the pattern is quite deep for its width. It sits well as a scarf, but is not so suited to wear as a shawl, and the amount of yarn I wanted to use to best display the colours I had resulted in the shawl growing deeper and deeper. I played around with varying the increases to make the shawl wider but eventually gave up and unravelled my knitting. The plan went sadly askew. So the search for a suitable pattern began again. 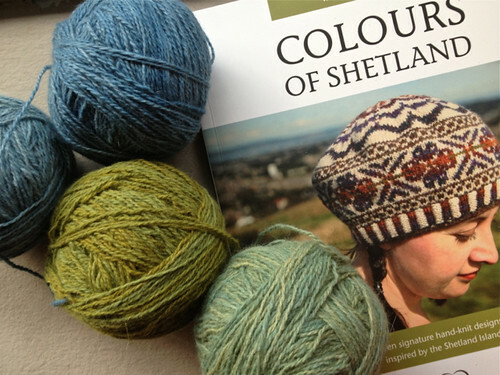 I remembered what the colour and texture of the yarn reminded me of - Kate Davies' recently published Colours of Shetland. In particular, the Northmavine Hap. Perfect, except that I don't have enough yarn. So, a bit reluctantly as I counted the air miles again, I've ordered more yarn. My justification is that it's more sustainable in the long run to have a shawl of lovely yarn that I will wear than one that lies unused in my wardrobe. It's that time of year. 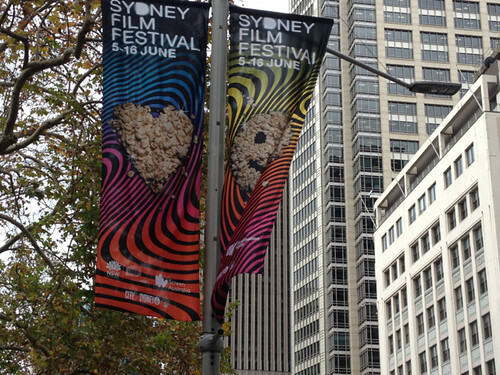 The Sydney Film Festival. The SFF gives me such pleasure. It's an opportunity to immerse myself in films for 10 days or so, indiscriminately overloading on ideas and images and world views. 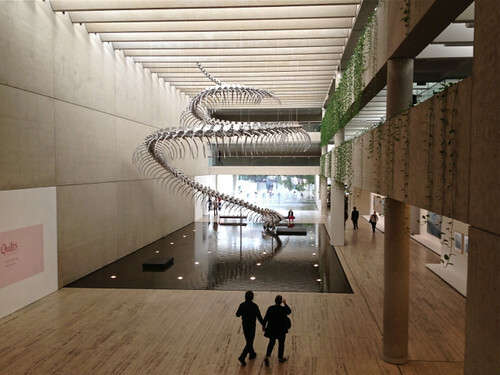 It's rather like visiting the great museums of the world and having the opportunity to 'get your eye in'; to see relationships and trends and influences and begin to make judgements about what's good and what's less satisfying. I'm more than halfway through the Festival and have seen about a dozen films. Choosing the films to see is always a bit chaotic, determined by convenience and availability as well as what appeals from the brief introductions and descriptions. This year the choices have been so much easier because I've not had to fit my film-going around work commitments, though I think I rather miss the rush and bustle of previous years as I fitted film viewing around the busyness of my work life. I'm already wondering how I managed it! For the past few years I've written posts with brief reviews of the films I've seen. For whatever reasons, this year I decided not to do so. It's not that the films have been less interesting or stimulating, and I am rather regretting my decision because writing about a film, however briefly, does push me to think more deeply about my responses. However, there are a couple of films I do want to mention. I'm mainly a fiction reader and a 'fiction' film viewer, but this year at the Festival I've chosen to see quite a few documentaries and two of them, in particular, have so far provided my best viewing experiences. Long-term British film-maker Ken Loach has made The Spirit of 45 - a film about the hopes and realities of achieving a more equitable society in Britain in the aftermath of World War II. Loach has no intention of disguising his left-wing political affiliation, and in this documentary he is (as ever) brilliantly empathic and able to evoke the emotional impact of political choices. The film intercuts evocative and apposite historical documentary footage with interviews. Loach is served so well by the people he has chosen to interview, mainly articulate working class people now in their 80s and 90s. Some of the most moving parts of the film are recollections of people who survived the horrors of childhood in pre-war slums in Britain, and then strove, passionately, to better their world after fighting in the second world war. The political achievements of the 1950s in creating a welfare state are celebrated - education, safe working conditions, and health (also noted in the popular UK television series Call the Midwife). The film goes on to document the unravelling of these achievements through the Thatcher years and implicitly is a reproach to those of us who have allowed such hopes for improvement to be dashed. I was weeping by the end of this film. Though it's about Britain, its relevance to Australia is clear. Another sort-of documentary The Act Of Killing, by US/Danish director Joshua Oppenheimer, is just as politically committed as Loach's film, but very different - and more modern - in its method of story-telling. Oppenheimer has made a film about the horrors of the 'anti-communist' killings in Indonesia in 1965 when around three million people were killed by gangs of thugs sanctioned by the Indonesian government, and by Western governments in countries such as the USA and Australia. Many of the politicians who are currently in power either directly participated in encouraging these murders or now collaborate with or benefit from the acts of the killers. Oppenheimer initially decided to interview victims of the 1965 purge, but they felt unsafe in collaborating. He then chose the even more powerful path of allowing the killers, who boast openly of their actions, to tell the story and even gave them access to his film-making resources to tell their tale in film. So, as well as the most bizarrely self-incriminating interviews with the killers, there is a film within the film - an even more bizarre pastiche of musicals and film noir that the central character uses to tell his story. At about two and a half hours I would think the film is far too long for successful commercial distribution, but the story itself and the method of story-telling are so convoluted that it would suffer from being too compressed. I also went to hear Joshua Oppenheimer talk about his film with DH Lawrence's advice to 'never trust the teller, trust the tale' in the forefront of my mind. Sometimes film-makers, like writers, are not the best people to tell you about their creations. But Oppenheimer was excellent. He didn't try to interpret his film for his audience, but rather gave background and information on his methods of film-making. Like Loach, he wears his political heart on his sleeve, though his 'message' is a very complex one about moral choices within a global community. Today I'm off to see a French movie about a mother/son relationship with a score by Nick Cave(?) and an Indian thriller called 'Monsoon Shootout'. You can see why I love the SFF. So many opportunities to view the world.